Seen enough of Udaipur's lakes and palaces? There are a number of places to see near Udaipur that make great day trips or longer side trips, depending on how much time you have available. Here are eight of the best ones. The Mewar dynasty's most important fort, Chittorgarh was the capital of their kingdom for over 800 years until Mughal Emperor Akbar captured it in 1568 and Maharana Udai Singh II fled (he subsequently founded Udaipur and reestablished his kingdom there). However, its history extends back much further to the 7th century, when local Mauryan rulers started constructing it. Chittorgarh became a UNESCO World Heritage Site in June 2013. It's a massive fort, and fortunately the monuments can be reached by vehicle. Inside are old palaces, temples, towers, a reservoir (it has fish that you can feed), and a royal cremation ground. The Tower of Victory offers outstanding views across the fort and town. There's an evening sound and light show that narrates the story of the fort, but usually it's in Hindi only. Location: About two hours northeast of Udaipur, along the Udaipur-Chittorgarh Road. Opening Times: Sunrise to sunset, daily. Ticket Cost: Chittorgarh is free to enter and open all the time. However, you'll need to buy a ticket if you want to visit Padmini Palace (the main attraction). It's 300 rupees for foreigners, 25 rupees for Indians. Stay: Padmini Haveli is a delightful homestay in Chittor village, within the fort area. The hosts are both guides, so it's very helpful to stay with them. They provide bicycles for hire to ride through the fort. Another UNESCO World Heritage Site, isolated Kumbhalgarh Fort was built by Mewar ruler Rana Kumbha during the 15th century. The most important fort of the Mewar kingdom after Chittorgarh, it's perched high in the Aravali Range. The fort provided the rulers with an impenetrable place of refuge in times of danger. Its wall, which is often referred to as the Great Wall of India, is thought to be the second longest wall in the world. It's wide enough in parts for more than five horses to ride abreast! Feeling fit? You can hike along a substantial section of the wall, which has been restored. Notably, legendary Mewar warrior Maharana Pratap is believed to have been born inside the fort in 1540. People still live in there as well. Some of the attractions are hundreds of ancient temples, palace ruins, step wells, and cannon bunkers. Plan to spend three to four hours exploring the fort. Unlike Chittorgarh, vehicles can't enter, so expect some strenuous walking. The fort is most spectacular at sunset. If time isn't a constraint, you may want to stay on for the evening sound and light show in Hindi. Location: Just over two hours north of Udaipur, in Rajasthan's Rajsamand district. Haldi Ghati, where the great battle involving Maharana Pratap took place, is a popular stop along the way. Opening Times: Sunrise until sunset, daily. Ticket Cost: 300 rupees for foreigners, 25 rupees for Indians. Stay: For a regal experience, The Aodhi resort is an atmospheric royal retreat owned by the Mewar family. Festivals: The annual Kumbhalgarh Festival takes place at the fort from December 1-3 every year. It features performances from folk artists. 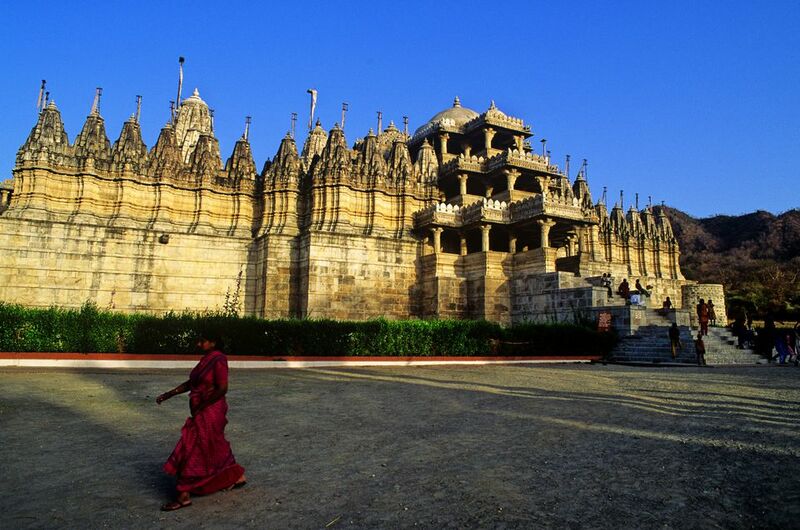 Jain temples are known to be the most elaborate in India, and the temple complex at Ranakpur is absolutely astonishing. Dedicated to the first Tirthankar (savior and spiritual teacher) who founded Jainism, it's the country's biggest and most important Jain temple complex. The main temple, Chaumukha Mandir, is made out of white marble and was built in the 15th century. It has 29 halls, 80 domes, and 1444 engraved pillars! Allow about an hour to see the temple complex. Conservative dress is required for both men and women (legs and shoulders covered). Leather items (including belts), shoes, food, and cigarettes are not permitted inside. Women who are menstruating are considered to be unclean and shouldn't go in either. From Ranakpur, it's possible to explore neighboring Kumbhalgarh Wildlife Sanctuary. Hiking from Ranakpur to Kumbhalgarh is an option. It takes about four hours, and requires a permit and a local guide. Hotels can take care of all arrangements. Location: Two hours northwest of Udaipur. Ranakpur is frequently visited along with Kumbhalgarh on a day trip. The travel time between each place is around 90 minutes. Opening Times: Non-Jains can enter the temple from noon to 5 p.m. Mornings are reserved for prayers. Ticket Cost: Entry is free for Indians but foreigners are charged 200 rupees each, which includes an audio guide. There's also a fee of 100 rupees per camera (this includes a cell phone with a camera). Stay: Try the King's Abode, or Manna Hotels if you're on a budget. If you're spiritually inclined, it's worthwhile taking a trip to the compelling 8th century Shri Eklingji Prabhu Temple. Dedicated to Lord Shiva, the temple complex is made completely out of marble. It also contains large colorfully painted statues of Lord Shiva’s Nandi Bull. The original shrine was built by Bapa Rawal, founder of the Mewar Dynasty. The current head of the Mewar royal family continues to worship at the temple every Monday. Do note that photography isn't allowed inside the temple. Walk around the back of the temple complex for an unforgettable lake view. Nearby at Nagda, and worth seeing too, are the ancient 10th century Saas Bahu temples dedicated to Lord Vishnu. The temples are covered in intricate sculptures. Location: Kailashpur, the modern name for Eklingji, about 30 minutes north of Udaipur along National Highway 8. Opening Times: 10.30 a.m. to 1.30 p.m, and 5 p.m. to 7.30 7.30 p.m. Ticket Cost: Entry to Shri Eklingji Prabhu Temple is free for all. There's a nominal fee at the Saas Bahu temples. Drive about 10 minutes further north of the Shri Eklingji Prabhu Temple and you'll reach Delwara. Not many people are aware of this town, apart from the fact that the famous luxury Raas Devigarh hotel is situated there. It's housed in an 18th century palace. There are also thousands of temples (including ancient Jain temples), step wells, and a thriving crafts tradition. It's a prime example of a rural village that has undergone profound social changes over the past few years. The 2-hour Delwara Heritage and Community Walk is a meaningful way to explore it. The walk is led by the town's young adults, who have put hundreds of hours into researching Delwara's history and training as guides. It's very inspiring! Location: The walk starts at Sadhna Production Center on National Highway 8, near the entrance to Devigarh, in Delwara. Cost: 300 rupees per person. Walk Times: Hourly between 10 a.m. and 6 p.m, seven days a week. Bookings: Call 8107495390 (cell) or email delwarawalk@gmail.com. Keep driving about 30 minutes north along National Highway 8 and you'll arrive at the small holy town of Nathdwara. Its 17th century Krishna temple, which houses an idol of Shreenathji, attracts a lot of pilgrims. However, of particular interest are the traditional Pichwai paintings, featuring scenes from Lord Krishna's life. You'll come across them on the walls of buildings all over town. They're repainted every year just before the Diwali festival, making Nathdwara a wonderful offbeat place to celebrate Diwali in India. Nathdwara also has noteworthy night market close to the Shrinathji Temple. Head about 20 minutes west of Nathdwara, on National Highway 162, to the village of Molela. It's remarkable for its artisan families who make terracotta plaques with sculptures on them, featuring gods and goddesses, and village scenes. The artisans believe that they've been ordained by god to make the sculptures, and the skill has been handed down from generation to generation. The women usually prepare the clay, which is dug up from the nearby Banas River, while the men do the sculpting. Business is brisk during the Hindu month of Magh (January and early February), when temple priests and tribals come from as far as Madhya Pradesh to buy the plaques to use in worship. Kumbhalgarh can also be reached along this route via National Highway 162. It's about an hour from Molela. There are a number of options for enjoying the fresh air and scenery around Udaipur. Horse riding into the countryside is a popular activity, and it's extra special on a Marwari horse. These brave, revered creatures were owned by Rajput rulers and used in battle. Reputable providers are Krishna Ranch and Princess Trails Farm. Alternatively, if you don't want to ride, go walking! As its name suggests, Mountain Ridge is a rustic but luxurious homestay perched on a...mountain ridge 20 minutes from Udaipur! They conduct outback treks and safaris with tribal guides. Visrat Experiences, a community tourism initiative, also arranges Udaipur outback tours to villages to meet tribes and learn about their organic farming methods.